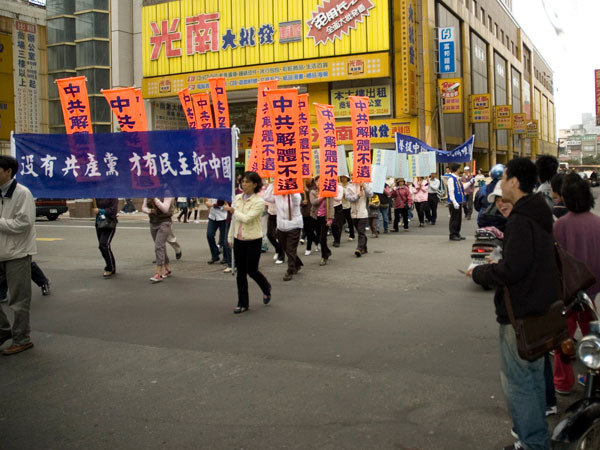 On March 8th, 2008, the Global Service Center for Quitting the Chinese Communist Party (CCP) Taiwan Branch organised a large rally at Jhongjheng Park in Chongli City in support of the 34 million Chinese people who have formally quit the CCP and its affiliated organisations. Invited speakers included Taiwan Executive Yuan (State Department) principal councilor Chwei-jen Chyou, Taiwan Falun Dafa Association president Ching-Chi Chang, and representatives from the Global Mission to Rescue Persecuted Falun Gong Practitioners. The rally was followed by a large parade in downtown Chongli. 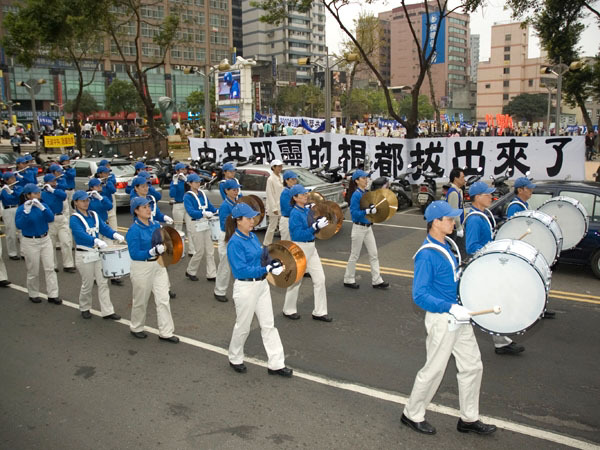 Participants in the rally and parade included local residents, the Miaoli Waist Drum Team, the Falun Gong Divine Land Marching Band, Celestial Maiden dancers, and the Organ Harvesting and Torture Reenactment teams. 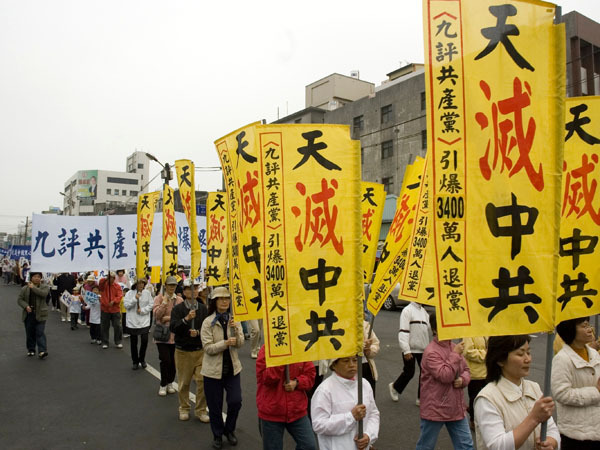 At the rally, Mr. Chwei-jen Chyou, Taiwan Executive Yuan principal councilor, said that he supported "Truthfulness-Compassion-Tolerance", the principles of Falun Gong, and that he believes the persecution against the practice should not be tolerated. He said, "If the CCP is not disintegrated, the world will never have real peace." Mr. Chyou also expressed his admiration of the unyielding spirit of Falun Gong practitioners persecuted in China. "Regardless of party affiliation, I hope that all Taiwan residents will support this event and pay close attention human rights in China." Mr. Yun-lin Wang, a representative from the Global Service Center for Quitting the Chinese Communist Party, urged Chinese people to denounce the CCP. He said: "Since the publication of the Nine Commentaries on the Communist Party, many Chinese people have quit the CCP after realising the evil nature of the party. The mission of the Global Service Center for Quitting the Chinese Communist Party is to help more people to quit the CCP." At the rally, Taiwan Falun Dafa Association president Ching-Chi Chang expressed his thanks for support from all circles. In addition, he alerted Taiwan businessmen to see the true state of the Chinese economy. "Though China's economy is rather active, the economic system is still dictated by the CCP, and all major economic decisions and resources are under the CCP's control. The CCP will inevitably disintegrate, and Taiwan businessmen should be aware of this fact as they are so involved in China's economy." 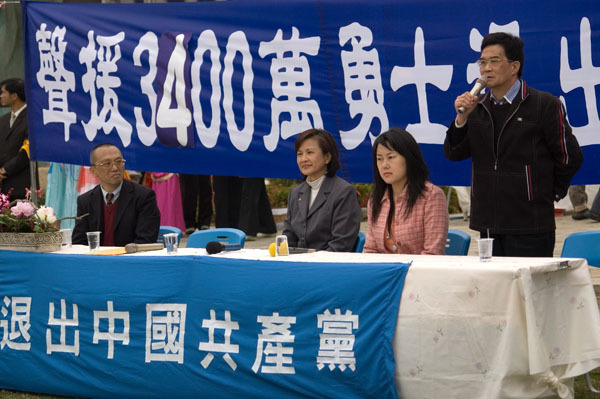 Yan-mei Liao, a representative from the Global Mission to Rescue Persecuted Falun Gong Practitioners, said that the Mission paid close attention to the Chinese people's movement to quit the CCP, as the party is still persecuting Falun Gong. Most recently, the communist regime has arrested many practitioners in the name of safety for the Beijing Olympics and it has been confirmed that more than 100 practitioners in Beijing alone have been arrested. 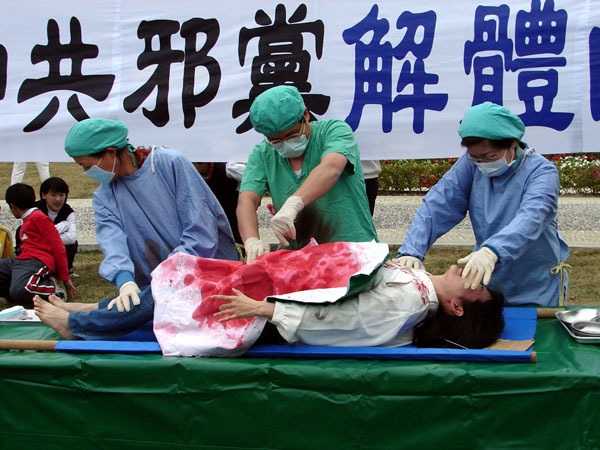 Ms. Liao also reminded the public about the CCP's atrocities of harvesting organs from living Falun Gong practitioners. "After the Holocaust, the United Nations promised the world that such atrocities would never happen again. Everyone should take action now to stop these appalling atrocities happening in China." Yinyi Su is a volunteer for the Global Service Center for Quitting the Chinese Communist Party, and she shared a touching story at the rally. "The recent severe snow storms in China awakened many Chinese people. During this period, an 82 year-old senior travelled to villages in 28 counties in Guizhou Province and helped 527 people to quit the CCP. After encountering many technical difficulties, he managed to send the list of names to the Global Service Center for Quitting the Chinese Communist Party. He said that people in his area were facing cold and hunger and several hundred seniors died. However, corrupt local officials took no actions to rescue the civilians. "I am already 82 and I fear nothing. Since the CCP came into power, we have suffered so much. This is not a natural calamity. 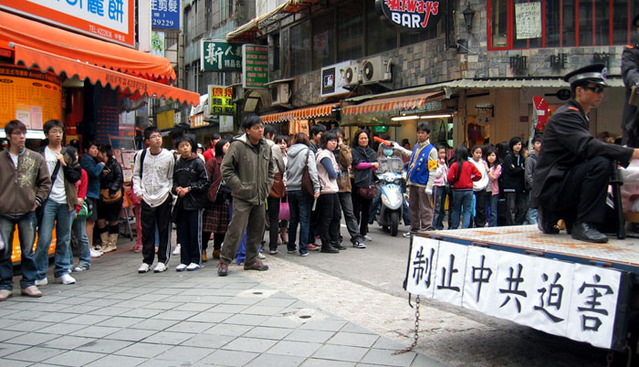 It is a human disaster caused by the CCP." Ms. Su said that there are numerous cases in which people used their real names to quit the CCP. The parade marched through the bustling Chongli downtown area and attracted many spectators. They were shocked by the atrocities exposed by the event, and many expressed their support.